A newly discovered protein could help detect, target, and collect from the environment the rare-earth metals used in smartphones. Two new studies by researchers at Penn State describe the protein, which is 100 million times better at binding to lanthanides–the rare-earth metals used in smartphones and other technologies–than to other metals like calcium. The first study, which appears in the https://pubs.acs.org/doi/10.1021/jacs.8b09842″>Journal of the American Chemical Society, describes the protein, and the second paper, which appears online in the journal Biochemistry, describes its unique structure, which likely plays a role in its remarkable selectivity for lanthanides. The research team discovered the protein, which they named lanmodulin, within the bacterium Methylobacterium extorquens, which grows on plant leaves and in soil and plays an important role in how carbon moves through the environment. The bacteria require lanthanides for the proper function of some of their enzymes, including one that helps the bacteria to process carbon, which is required for its growth. The protein’s unique structure, which Cotruvo determined in collaboration with the lab of Scott Showalter, associate professor of chemistry at Penn State, may explain why it is 100 million times better at binding lanthanides over calcium. 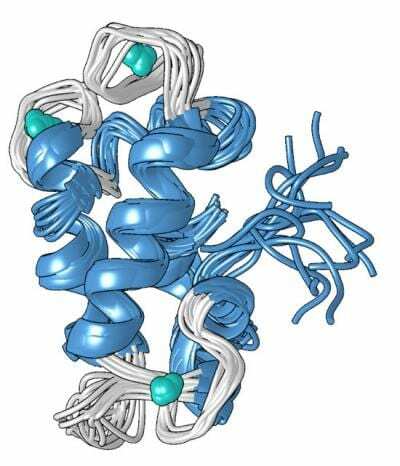 In the absence of metal, Cotruvo explained, the protein is mostly unstructured, but when metal is present, it changes conformation into a compact, well-defined structure. The new compact form contains four structures called “EF hands.” Human cells contain many proteins with EF hands, which are involved in using calcium for functions like neurons firing and muscles contracting. These proteins also bind lanthanides, though lanthanides are not physiologically relevant in humans and the proteins are only 10 or 100 times more likely to bind lanthanides than they are to bind calcium. The compact structure of the lanmodulin protein also contains an amino acid called proline in a unique position in each of the EF hands, which may contribute to the protein’s lanthanide selectivity. Understanding how the protein is so selective may provide insights for the collection of lanthanides for industrial purposes, including extraction from mining waste streams. In addition to exploring the protein’s mechanism of selectivity and the function of the uniquely located amino acids, the research team is also exploring the protein’s affinity for other metals, because lanthanides are often found in the presence of other metals, including iron, manganese, and aluminum, that occur in greater abundances. In addition to Cotruvo, the research team that initially described the protein includes Emily Featherston, Joseph Mattocks, Jackson Ho, and Tatiana Laremore from Penn State. In addition to Cotruvo and Showalter, the research team that described the structure of the protein includes Erik Cook and Emily Featherston. This work is funded by the Penn State Eberly College of Science Department of Chemistry and the Penn State Huck Institutes of the Life Sciences. Additional support was provided by the National Science Foundation.